Here's some photos of the Archer Airguns "XP" Tune Kit for QB78 family air rifles. 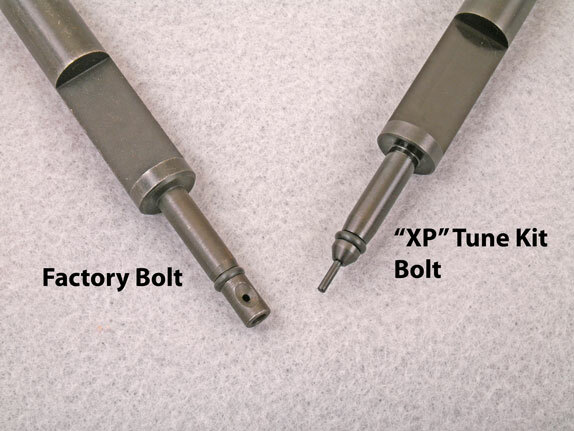 The first one shows the difference between the "business end" of a .22 caliber factory bolt and the "XP" tuned bolt. 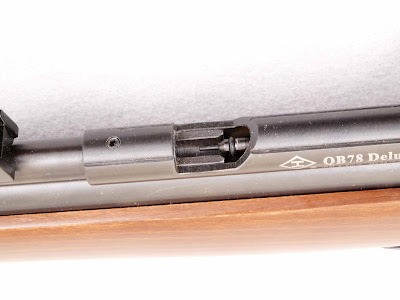 And here's a shot of the "XP" bolt fitted in a .22 caliber QB 78 Deluxe. The bolt was pushed slightly forward to show the probe section. As you can see, the "XP" bolt provides much less metal at the front of the bolt to hinder the passage of gas, and this is a vital element in allowing the "XP" Tune Kit to provide such an increase in muzzle velocity. Bummer that this cannot be shipped into Canada. The muzzle increase would definitely be nice. New Leapers scopes are great value.